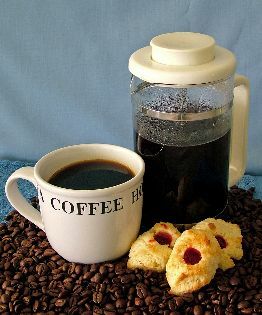 Coffee is one of those things that can be considered a must-have staple item, or a special occasion item. Lots of people treat drinking coffee as an important social ritual. That's why a coffee gift basket is so appropriate for so many celebrations. When you get together with friends, it's often at the coffee shop, and you share your life and your joys, your concerns and laughter, over coffee. What do congregations do after services? Coffee hour! What do you serve a friend who needs to talk something over, or share something exciting, or who needs a shoulder to cry on? Coffee! Business and social meetings are held together with the help of a good cup of coffee. People have first dates over coffee. You drink coffee on chilly evenings in front of a warm fire. And you certainly drink coffee in the morning while reading the freshly delivered newspaper or planning out another busy day. If you're looking for the right gift for a serious coffee drinker, think about what a hit a coffee gift basket would be! Coffees come in so many flavors. You can find anything from chocolate to peppermint to pumpkin pie flavored coffees! And in different “roasts,” too – mild, medium, medium-bold, bold and even special dark roasts. One of the nicest things about coffee gift baskets is that they make wonderful gifts for any coffee drinker. A teacher or boss is a prime candidate for a great gift like this. And what about your helpful neighbor, your sister who just loves coffee, your best friend the coffee hound, or your co-workers? Coffee gift baskets come in many sizes, so you can spend a little or a lot on a nice gift. Coffee gift baskets make great variety gifts. You can include coffees that are already ground, or whole beans. Coffee from the world over can be included, as well as fair trade and organic coffees. Shade grown coffees are eco-friendly, and will make the ecologically minded coffee drinker on your gift list happy. And don't forget decaf coffee for those coffee lovers who don't like the caffeine jolt. When you're giving a coffee gift basket, remember that you can add some extra special touches. A special mug or pair of mugs is a wonderful addition. You can get mugs in your recipient's favorite color or with a funny saying on them. Or give a nice travel mug to go with your gift of coffee. Use your imagination. If your coffee lover is also a dog lover, get a set of mugs with dog pictures or cartoons on them. 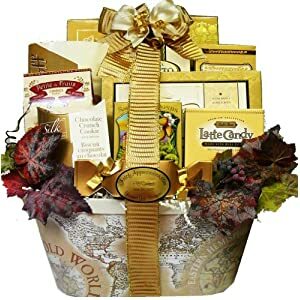 Other nice additional gifts could be some specialty teas as a compliment to the coffee, coasters, drink napkins, a grinder or fancy scoop, some chocolates, cookies or biscotti, or flavored coffee syrups. Coffee gift baskets are perfect as holiday gifts, and work well for just about any other occasion, too. If you have a coffee lover or two on your gift list this year, wrap up a coffee gift that is sure to be a winner! I am what is called a coffee hound! That is my drink. It used to be fully caffeinated, but since I've gotten old(er) I have gone to half-caff in the mornings and decaf for the rest of the day. One of my children buys me gift boxes and baskets for Christmas, usually. One year I got a Starbuck's gift card. I am a serious coffee snob and like certain flavors and no more. I will, however, try a new flavor. Very nice post and I'm going to check out the instructions on how to make my own baskets. Thanks for an interesting morning, Helene. Glad you liked the post Ruth! I didn't know you were a coffee hound, and a snob about it to boot!